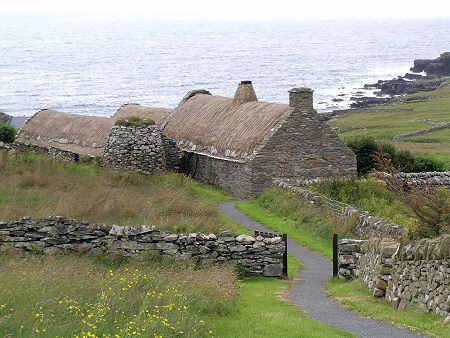 A little loop of side road to the east of the main A970 just south of Boddam takes you past the Shetland Crofthouse Museum at Voe. 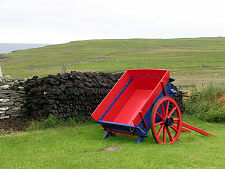 A visit makes a fascinating diversion for anyone wanting a real feel for how very many Shetlanders would have lived during the mid 1800s. 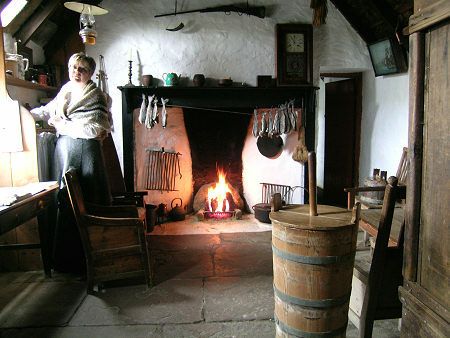 The crofthouse effectively recreates the accommodation that would have been typically used by an extended family unit of grandparents, parents and children. It has always been said that a Shetlander was a fisherman who farmed, and the man of the family would probably have been away much of the time fishing, whaling or as a seaman. The rest of the family would have operated the crofting side of the operation. 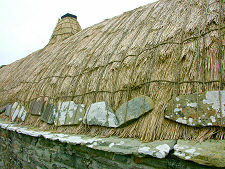 The museum comprises two parallel runs of thatched building, largely joined together side to side. Within this one small complex of buildings all the farming activity would take place except for the operation of the water mill, which is a couple of hundred yard nearer the coast on the bank of a stream. You enter via a lobby that gives access to all the parts of the steading. The living accommodation for the family comprised just two main rooms, taking up two thirds of one side of the crofthouse. You first enter the main room, the "but end". This is home to the main peat fire, over which fish were hung to smoke. One whole corner is taken up by a large wooden box bed, a device for giving its occupants a little more warmth and a little more privacy. 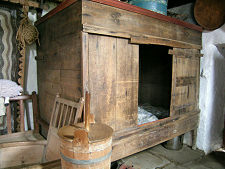 The second room is the main sleeping area, the "ben end", with a box bed, plus another bed and cots. 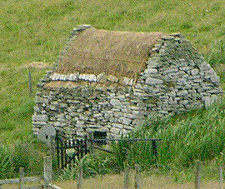 Shetland has no trees, so much of the wood used to make the furniture and in the structure of the crofthouse was driftwood washed up on the shore. 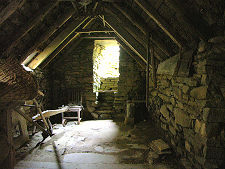 The remaining third of the "front" part of the building was used as a byre for the family's cattle. The rear part of the building was divided into a stable on one side, and a barn on the other. At the far end of the barn was a corn drying kiln.